ACT13 has now pulled out its sixth shallow firn/ice core. Core six, from which we will reconstruct annual variability in summer melt back at least two decades, was recovered from just south of the abandoned Dye-2 radar station. As the coring site was located on the other side of the US Air Force C-130 (Hercules) runway from our camp, we would have to wait for up to 30 min for clearance when commuting across the active runway. We're especially excited about core six, as a core was recovered from the exact same location by NASA's PARCA (Program for Arctic Regional Climate Assessment) project back in the 1990s. The means we can make a direct comparison of how the amount of refrozen meltwater retained in the firn as ice has changed over the past two decades. At first glance, it's obvious that there is way more ice in the firn now than two decades ago. We're hoping to nail down exactly how much more, and even figure out how much meltwater generated at Dye-2 might be running off to the ocean (as opposed to refreezing in place). Unfortunately, bad weather has once again moved into the area. As we perform our ice core processing outdoors, the core processing can easily be derailed by high winds (even when we build large snow walls to act as wind breaks). The first thing to happen during processing is logging the core stratigraphy (the layering of firn and ice). The core is then cut with a hand saw into little 10 cm sections and weighed for density. Finally, a drill is used to pull out little plugs of ice from each section to send back to Copenhagen for isotopic analysis. Each of these tasks is increasingly difficult to perform as the amount of blowing snow increases. So, while another strong storm has cancelled C-130 flights in and out of Dye-2 and forced the ACT13 crew to once again batten down the hatches, at least we can take comfort in the fact that strong storms tend to bring warmer air on to the ice sheet. 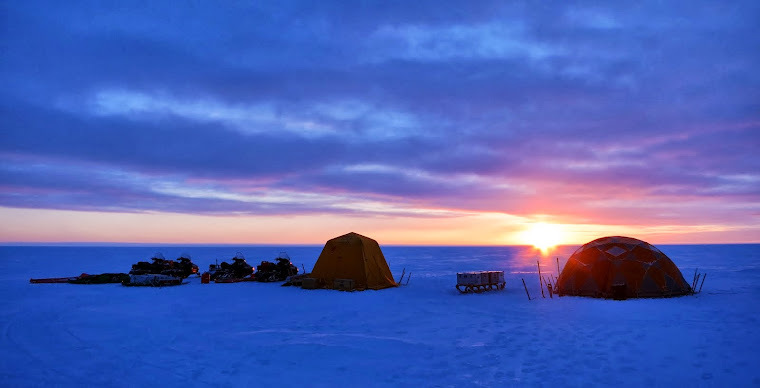 Our team members deployed on the ice sheet have already had their fill of whiskey-freezing nights thanks!